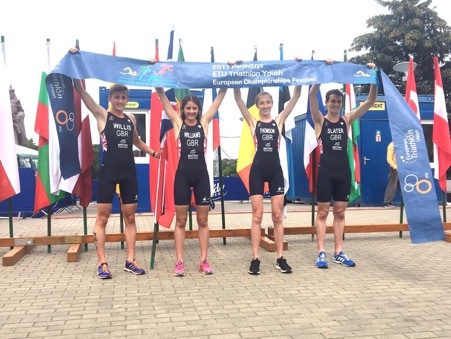 I had an amazing experience at my first international race: the European youth championships in Panevezys. After an anxious wait, I raced the semi final on Thursday. 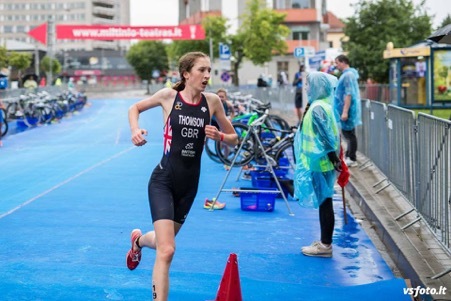 Having had a strong swim and bike I was onto the run in contention for qualification – I had to come in the top 9. I had the second strongest run of the heat and finished in 5th with a secure place in the final having executed the technique id been working on in training. With a lot of confidence gained and feeling excited, I was ranked 15 th for the final which was short and fast. I had a great swim and managed to avoid most of the chaos round the first buoy, leaving the water 7th. The bike consisted of a short 3 km circuit with some technical sections including a dead turn. Within the first lap I had caught the front group and we worked hard as a group of 13 on extending the lead. Heading out onto the run I had put myself into a strong position and went out fast. I was thrilled to finish the race in 11th and 2nd of the British girls. By Sunday, I was ready for my third and final race: the mixed relay. I was really excited to be picked for the team which had a great sense of unity. I started the first leg and felt a real sense of enjoyment as I was racing knowing all the team were supporting me. After a strong but chaotic race, I handed over in 5 th. My team mate Dan Slater then raced brilliantly and built a lead handing over to Abbie Williams who then remained in front. Finally Matt Willis had an amazing race and crossed the line, where we were all cheering, in first. We were all overwhelmed and proud to be the European mixed relay champions and had an amazing moment on the podium. Overall I had an incredible time and would never have believed that I would be returning with a gold medal. I’ve gained a lot experience, learned some good lessons and made great friends. I’m grateful for all the support and help from the British Triathlon team, the Dave Aitchison fund and Optima and can’t wait to race again soon.